The class of 2010 will be the first to meet TechCASH’s younger cousin, Dining Dollars, which isn’t quite legal at all campus convenience locations. TechCASH accounts will include a new feature that allows students and parents to earmark money to be spent only on food beginning this fall, announced Director of Campus Dining Richard D. Berlin III. The separate account, called Dining Dollars, can be maintained and accessed just like a normal declining balance TechCASH account, but the funds can only be used to purchase food. The percentage of freshmen declaring a major in Course VI (Electrical Engineering and Computer Science) has decreased and is now roughly half what it was five years ago, according to data from the Registrar’s Office. For other majors, the number of freshmen declaring each course remained relatively constant. The data include freshmen with sophomore standing. 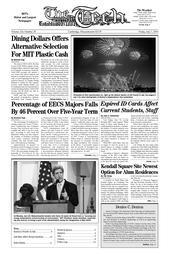 Last Friday, June 30, several thousand MIT cards expired. While many of those cards belong to recently-graduated students, a substantial number of current students were inconvenienced, some of whom were still waiting in line when the Card Office closed last Friday afternoon. Next year, the Card Office expects to send out e-mail reminders in advance of card expiry. A location on Third Street near Kendall Square in Cambridge has been identified as the most recent possibility for the site of a planned residential community originally targeted at senior members of the MIT community. The planned buildings, which would consist of 160 residential units, would require modifications to existing plans. Occupancy could begin as early as late summer 2008, according to the University Residential Community Web site. Denice D. Denton ’82, chancellor of the University of California-Santa Cruz and an MIT alumna, passed away on June 24th in San Francisco. She was 46. Just over a year ago, Cambridge’s prestigious Broad Institute started an idealistic medical-research project, fueled by millions of dollars from drug companies, to create powerful new molecules and make them cheaply available to lab researchers around the world. The following incidents were reported to the MIT or Cambridge Police between June 15 and June 27 or July 5, 2006, respectively. This summary does not include incidents such as suspicious activity, false alarms, or medical shuttles.